It's the next in line of Bandai's Sailor Moon Figuarts line, #4 in the series, Sailor Venus, AKA Sailor V. So how does she measure up to the previous figures? For this figure I took a chance on Amazon again because it was the cheapest place to find it. The last figure I bought from them was my Sailor Mercury figure, and on 3 separate occasions the box came crushed beyond salvation. Thankfully, this time Amazon got their act together and actually sent the figure in a box instead of a cardboard envelop. It probably helped that I reminded them to send it in a box on 3 separate occasions before it shipped, but hey, whatever works. Like the rest of the figures, Sailor Venus comes with 4 faces and five sets of hands, as well as a couple of optional accessories so she can mimic a trademark pose or attack. And because she's Venus, she also comes with her feline partner, Artemis, who is also poseable with his head and tail. Her special weapon is her Sailor V mask, and unlike Mars and her stupid insane Ofuda, the mask is actually molded to the hand like Sailor Moon's Moon Tiara Frisbee. She comes with a default face, a determined face, a yelling face and a happy face because Venus was almost as perky as Usagi. 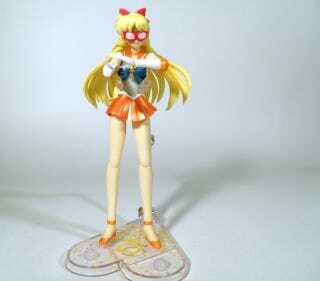 Like the Sailor Mars figure, she also has poseable hair, and in fact her bangs are the same mold as Mars as well. Since her hair is long and similar to Mars, she runs into the same problem with her stand as Mars does, so you have to position her differently so she doesn't stand with her hair dipped. Her interchangeable parts fit a lot better than the previous figures as well. Her hands and faces change quickly and easily and aren't too loose or too tight and she poses really well. Compared to the first 3 figures, that's a huge improvement. Her arm isn't broken, it just pops off too easily. I can snap it back into place no problem, but this joint wasn't supposed to come apart. She had no issues otherwise, so I decided to keep her, but things like this shouldn't be happening in a 40+ figure, especially this far into the manufacturing.